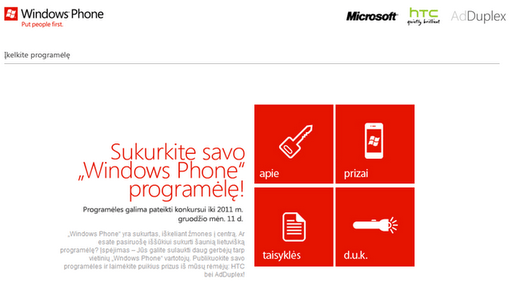 AdDuplex is proud to be a sponsor of the Microsoft’s app development contests in the Baltic countries. The rules are pretty simple: you have to create a Windows Phone app by December 11th, 2011 and submit it to the competition’s website. Then you get a free APPA Market account and you can publish your app to the official Windows Phone marketplace. Your app should pass the certification by January 18th, 2012 and on January 23rd the winners will be announced. The contests are separate in each country so you are only competing against your local peers. The winner in each country gets an HTC Titan and 250,000 ad impressions on AdDuplex, 2 runner-ups get HTC Radar phones and 100,000 ad impressions each, and the best student app gets an LG Optimus 7 and 20,000 ad impressions on AdDuplex. Each country has a dedicated localized website. Click the name of your country for the appropriate site: Estonia, Latvia, Lithuania.